Home » info » Tirumala Donation Schemes TTD Donor Digital Passbook Apply now. Tirumala Donation Schemes, apply for TTD Donor Digital Passbook, Check Donation Offerings, and Privileges. How to give Donation for TTD trusts for Suprabatha Seva, L1 L2 Break Darshan yearly. Donation offerings for religious rituals and corpus fund is a common thing for devotees. People who visit Sri Venkateswara Swamy Temple in Tirumala hill will always try to offer their money as a fund to corpus hundi in temple. But for development of various facilities and infrastructure requires some systematic and governing body. So TTD has started accepting donations for separate causes in the name of separately governed trusts. Let us have a look about the list of trusts currently operated by ttd board. Sri Venkateswara Sarva Sreyas Trust. Sri Venkateswara Heritage Preservation Trust. Sri Srinivasa Sanakara Netralaya Trust. 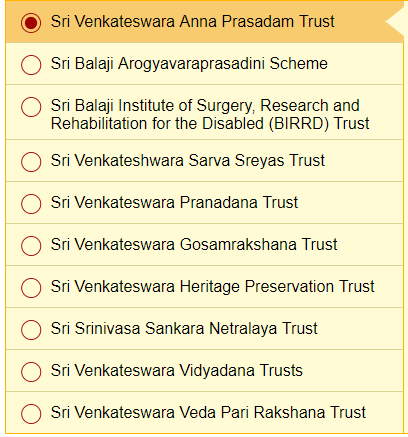 Sri Venkateswara Veda Pari Rakshana Trust. All above trusts welcome the donations of any amount. Minimum Offering is 1 rupee to 999 without receipt for tax deduction. 1000 Rupees to 99,999 Is eligible for tax deduction Certificate from TTD Board. The donations over 1,00,000 Rupees is eligible for special darshan privileages. The only seva offered for the big donations is Suprabatham. Other than this no Arjitha seva is provided for devotees. 1 to 5 Lakshs: 1 Day Suprabatha Darshanam for 5 Persons on a selected Date at time of Passbook Generation. Accommodation for one day. One Blouse Piece or Uttareeyam, six small laddus. 5 Laks to 10 Laks Donation: 3 Days of Suprabatha Seva darshanam for five members. 3 Days Accommodation. 1 Duppatta with blouse. A single Gold Plated Silver Medallion is presented at the time of Donation. 5 Mahaprasadams are also provided for this donation. 10 Laks to 1 Crore: 3 Days of L2 List VIP darshanam with 3 Days accommodation of 500 Rupees. 20 Small Laddus with 10 Mahaprasam sachets are provided. 1 Crore and Above: Tirumala Donation for TTD of this amount will be facilitated with 3 Dya sof L1 Vip Darshan Tickets. 3 Days of Accommodation of 2500 Rupees Guest house. 10 Big Laddus with 20 Maha prasadam Sachets are provided as a present. We are the privileged donors for SRI VARAHA SWAMY GUEST HOUSE SUITE NO 110 and submitted self declaration along with ID proof on 18th May 2018 for continuing privilege Donor passes from July 1st. We are continuously following for the last one month for updating. But the concerned section is always informing us to wait till last week. Now it is informed that they have not received the same. Finally I informed about the date of mailing as well as sending the details of the hard copy by rigistered post, now they have confirmed about the receipt and promised that it will be activated today. But till it is not yet activated and we are proceeding to Tirumala on 4th July for performing sevas which have already confirmed. Based on our Donor accommodation we have not booked any rooms. Hence lookinto the matter and provide accommodation for 5th and 6th July. The datails are already submitted by mail. I am trying to register pass from one year mobile activation comes but email activation doesn’t come. I have given 3 email from from one year and non is register. Today again I tried to register but no email activation. Can I come do some services to the Gomatha.